An Experts Group Meeting – EGM was organized to review and feedback the first report of the Scoping Study. More than 30 representatives from public and private sectors, CSOs, academia, international development agencies, social leaders and activists from all over the region were gathered on July14-15 2016 in San José, Costa Rica. Sessions were available via live stream and international experts, as well as, local practitioners joined.“Concepts, Contexts, and Solutions for Responsible Land Governance, and Secure Tenure in Latin America and the Caribbean” was the central theme of the EGM, having a particular relevance in the context of the Sustainable Development Goals - SDG; the formulation, and implementation of the New Urban Agenda – NUA, and the Third United Nations Conference on Housing and Sustainable Urban Development - Habitat III. The meeting pursued to operationalize the concepts of responsible governance, secure land tenure, and sustainable land use, to identify “patterns” of urban contexts, and best and promising practices, and possible solutions and tools to ensuring fair, prosperous inclusive, resilient, and sustainable cities. A regional network of researchers in 10 countries (Brazil, Argentina, Paraguay, Peru, Ecuador, Colombia, Honduras, México, Jamaica and Dominican Republic) undertakes the Scoping Study with the supportive hypothesis that tenure issues, socio-spatial segregation, or ecological stress of urban and peri-urban land systems would not exist under a redistributive, inclusive, and sustainable approach to cities governance. An extensive desktop study, semi-structured interviews with more than 50 land experts, and face-to-face dialogue with mayors and municipal officers has been undertaken so far. The concept of security of tenure has become more nuanced along the time; there is a tacit convention to link informal settlements with unsecure land tenure, however, examples show that this is not always the case. Strong need to raise awareness on the negative impact of having inappropriate urban land governance systems. Celebrate the regional initiatives that lead to higher levels of urban land security of tenure, like the Brazilian and Colombian initiatives, the recently approved urban land law in Ecuador and the ongoing efforts in Mexico, Argentina and Chile, but recognising the existing challenges on implementation. 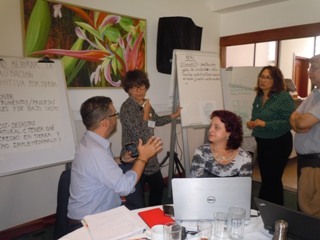 Dissemination and validation of the Scoping Study at country/sub-region levels starting by Costa Rica (for Central America), Trinidad and Tobago (The Caribbean), and Peru (South America). The conclusions recommendations and agreements will feed the final report of the study that will be presented at HABITAT III, Quito, 2016.